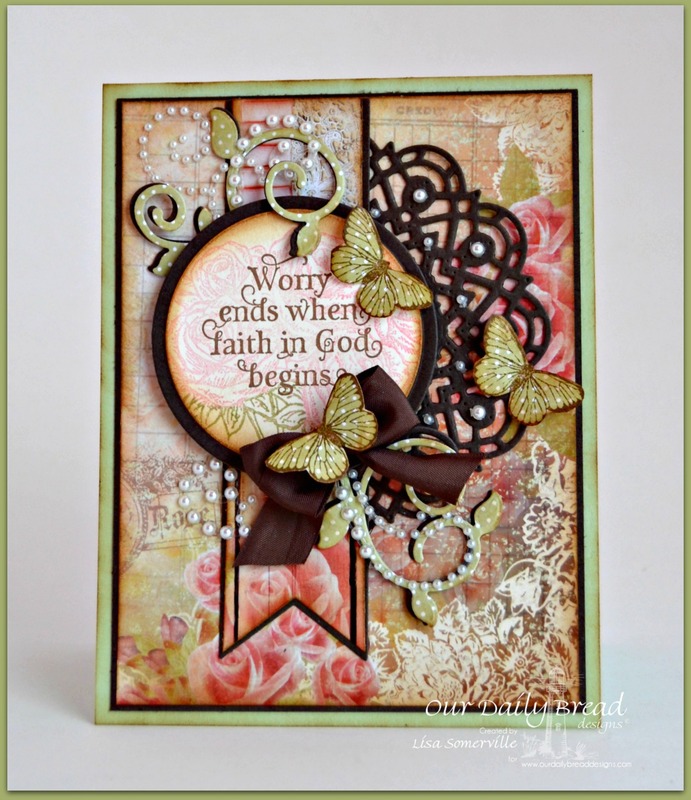 Welcome to Our Daily Bread Designs Blog Hop featuring the ODBD Designers Favorite cards created with ODBD Products! Continue reading below to see how you can enter to win a $15 Gift Code to the ODBD website! It was hard to only select THREE ODBD cards to feature for the Designers Favorites Blog Hop! Here are my three projects, in no particular order. Please click on the photo to be taken to the blog post where I originally posted the projects, if you would like more details on how it was created. Three randomly selected winners will each receive a $15 gift code to the ODBD Store just for commenting on the Design Team cards! You have until March 22, 2016 at 9:00 p.m. EDT to leave your comments on the Designers Blogs for a chance to win! The Winners will be posted on the ODBD Blog on March 24th, so be sure to check back there to see if you won! As Always your cards are Fabulous. Love the Stars & Stripes. Keep them coming. Thank you for sharing. So beautiful - love all of the elements on your creatons! Each card is unique and beautiful, but the military card is my favorite one. Happy 8th Anniversary to ODB! My you be blessed with many more anniversaries to come. I'll be looking forward to all the beautiful cards posted each week. Your cards are wonderful! I especially like the tone-on-tone feel of the card with the butterflies. So pretty. wow your cards are lovely. thanks for sharing and inspiring. Great cards. 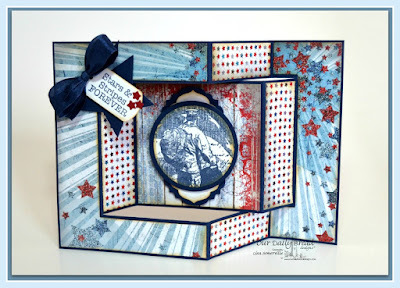 Love the butterlies (and appreciated the video how-to – so makes me want to try this) and the Tri-fold patriotic card just speaks to my heart. Purely classy looks which are beautifully done. Thanks so much for re-sharing these. Thank you for sharing your wonderful work. I am fond of butterflies & will have to use my dies soon! Lisa, I love the three cards you've chosen! I love the beautiful butterflies on the first one, and I love the doily with the great sentiment, but the military one is so precious since I love to support our military. Beautifully done each one, my friend! And I love all your work! Hugs! I love all of your cards but my favorite is the second one, "When Worry Ends, Faith in God Begins"! Fabulous choices Lisa! Your style is always striking and detailed deluxe! Love your artwork! Your cards are incredible! 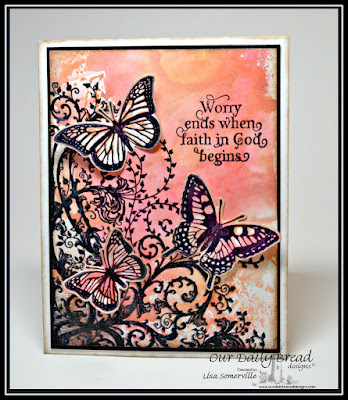 Love the softly watercolored background and the delicate butterflies! Yes, Yes, Yes the first card speaks to my soul! Love them all. So pretty! Hard to choose a favorite, but your first card is awesome! Love the colors and the butterflies! I love the beautiful butterflies on your first card, but all three all beautiful. Stars and stripes forever card! So beautiful it brought tears to my eyes! So lovely. Love the designs and colors. You are very talented. Can't decide if I like card 1 or 2 better. Your cards are lovely and a reflection of your creativity. Thank you for sharing. All so wonderful! My fave is the first one. Each of your cards is unique and lovely. Thanks for sharing them with us.